We offer Life Skills Education to equip mothers and their children to live Godly and productive lives by sharing God’s word, encouraging Christian life choices, teaching practical living skills, and providing spiritual and emotional support. Our goal is to provide a safe and emotionally supportive place for women to hear and experience the trans-formative power of the Gospel while being equipped, in very practical ways, to live productive and flourishing lives. A Woman’s Choice opened our first crisis pregnancy center in Hikes Point. Merged with Alternatives for Women Pregnancy Center and began operating our second pregnancy center located on Preston Highway. Our third location opened in downtown Louisville at 830 East Broadway (began operating under the name “A Woman’s Choice Resource Center”). The Hikes Point Center closed. The Broadway Center closed, and we opened a center at 101 West Market Street. The Preston Highway Center relocated to Trio Avenue. A Woman’s Choice expanded the ministry with the opening of Necole’s Place at the corner of Chestnut & Clay. The first class met at Necole’s Place. 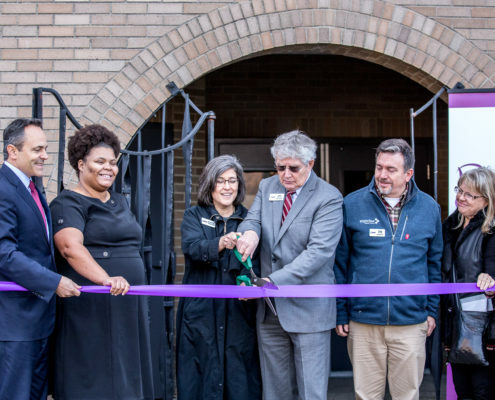 A Woman’s Choice opened an additional center at 140 West Market Street, adjacent to the only abortion clinic in Kentucky. Purchased the facility at the corner of 7th and Muhammad Ali to combine our main pregnancy center and Necole’s Place under one roof. A Woman’s Choice and Necole’s place merged into one combined center at 701 W. Muhammad Ali Blvd under the name BsideU For Life.